Ted Carmichael Global Macro: The Bond Market is Talking: Is the Bank of Canada Listening? The Bond Market is Talking: Is the Bank of Canada Listening? Don't get me wrong. I am not complaining that the Bank of Canada didn't take my advice last month to cut the policy rate. It was a close call. Many Bay Street analysts were frightened that a rate cut could trigger a currency crisis. The national media was focussed on the impact of a weaker Canadian dollar was having in pushing up imported food prices and the cost of Florida vacations. The January decision fell on the same day that rookie Prime Minister Justin Trudeau was making his maiden appearance at the Davos World Economic Forum, telling the world that he wanted Canadians to be known "for our resourcefulness" rather than for our resources. Cutting the policy rate on the same day might have been a disconsonant signal for the Bank of Canada to send when Trudeau was assuring the world that "Canada has something else that isn’t so easily quantifiable. Confidence". I have been very supportive of the BoC's actions since they began cutting the policy rate in January 2015. The Bank responded in a timely and appropriate fashion to the plunge in Canada's terms of trade that began in the summer of 2014, cutting the policy rate in two 25 basis point steps in January and July to it's current level of 0.50%. I recommended a further cut in January because commodity prices and Canada's terms of trade had continued to fall sharply. Prior to the decision, I noted that "if the BoC decides not to cut rates the Canadian dollar will likely rally, preventing it from acting as the cushion to the terms of trade drop that it needs to be". That is exactly what has happened. Information on the size, type and timing of federal fiscal stimulus was not yet available. The BoC preferred to wait until the Federal Budget is tabled to get a fix on how fiscal stimulus might accelerate the return to full capacity in the economy, which the BoC estimated would be "late 2017 and perhaps later", a "significant setback" from it's October projection. Depreciation of the Canadian dollar since October 2015 would add considerably more stimulus to the non-resource sectors of the economy than previously projected, although it could take up to two years for this effect to be fully felt. A further rapid depreciation of the Canadian dollar "could push overall inflation higher relatively quickly. Even if this is temporary, it might influence inflation expectations." "We don't think that's happening. We believe inflation expectations are very well anchored on 2% after 25 years of successful inflation targeting. But that is a consideration that we need to bear in mind when the exchange rate is moving quickly". Later in the Q&A, Poloz noted that how the Bank reacts to Canadian dollar weakness in the future would depend on the context. If the C$ were falling for no apparent reason, that would be a concern. But, he noted, "If the oil price is going down some more, that's another negative for the Canadian economy, and so the dollar is doing part of the adjusting for us". The BoC Monetary Policy Report suggested that another possible rationale for not cutting the policy rate was "highly stimulative" financial conditions, adding that "reductions in the Bank’s policy interest rate in January and July 2015 contributed importantly to these accommodative financial conditions". One of the best ways to assess the effect of monetary policy actions (or inaction) is to look at how the bond market responds. We can look at the spread between nominal and inflation-linked bonds as an indicator of inflation expectations. 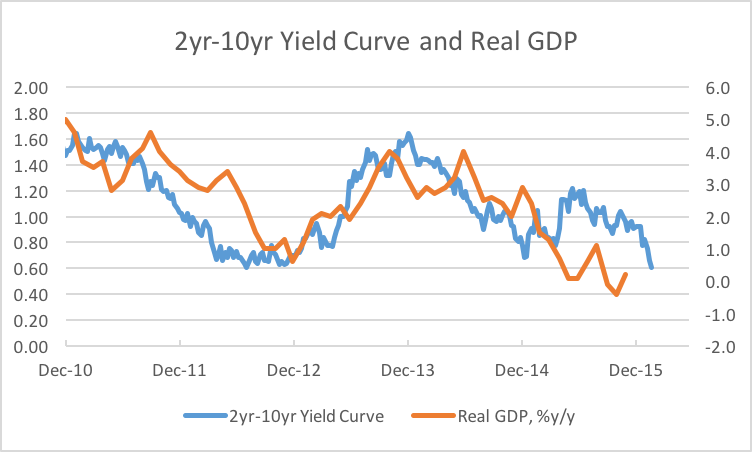 We can look at movements in the yield curve as an indication of the markets real GDP growth expectations. And we can look at credit spreads as an indicator of financial conditions. The chart below shows Canada's breakeven inflation rate as measured by the spread between the yield on nominal long term Government of Canada bonds and the yield on the Canada Real Return Bond (RRB). 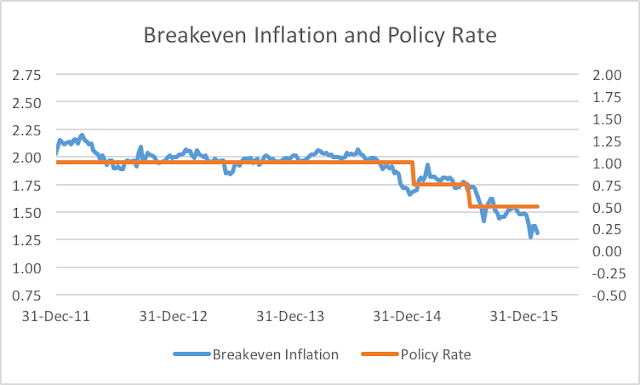 The breakeven inflation rate is a market-based measure of expected inflation. While Governor Poloz cited a risk of a rise of inflation expectations, the bond market is saying that the real risk is that inflation expectations could become unanchored from the 2% target on the downside. The latest market based estimate of inflation expectations, the breakeven rate, has fallen steadily since the summer of 2014 to just 1.29% on February 11. The BoC responded to downward moves in inflation expectations with two rate cuts in 2015, but has not yet responded to the further decline in 2016. The next chart shows the Canadian yield curve, measured by the spread between the Government of Canada 10-year bond and the 2-year bond. A higher spread, i.e. 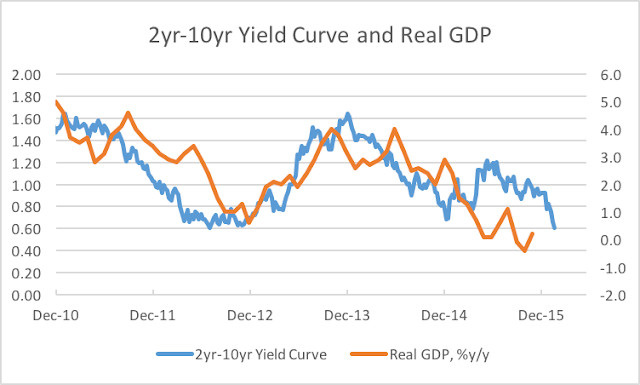 a steeper yield curve, is a market based indicator of stronger expected real GDP growth. A flatter curve indicates expectations of weaker growth ahead. Governor Poloz was upbeat on growth prospects, anticipating that actual GDP growth will exceed potential growth in 2016 and 2017, causing the economy to return to full capacity. But the yield curve has flattened significantly since the beginning of 2016, suggesting that market participants are anticipating slower growth ahead. The bond market is expecting a larger dose of fiscal stimulus in the 2016 federal budget than the new Liberal Government promised during the election campaign, but still expects growth to slow further. A third message from the bond market is that financial conditions are tightening despite the monetary easing supplied by the BoC in 2015. 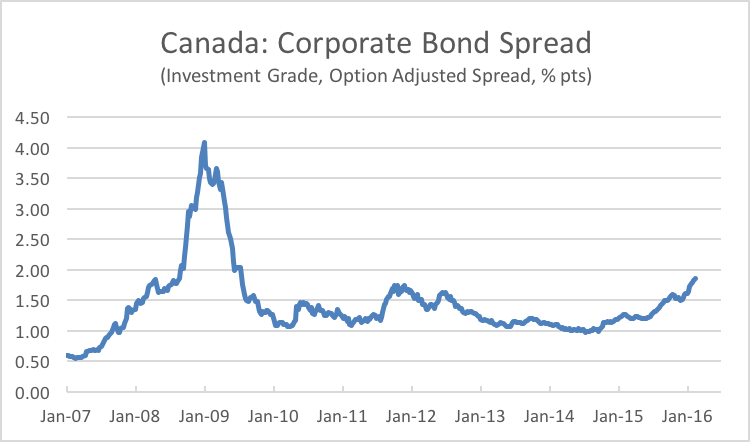 The chart below shows the spread between investment grade corporate bonds and the Government of Canada bonds of similar duration. The corporate spread has widened since the summer of 2014 by almost 90 basis points and is wider than at any time over the last decade with the exception of the credit crisis of 2008-09. Wider spreads reflect higher risk premia on corporate debt and tighter financial conditions for business. Further evidence of tighter credit conditions is provided by Bank of Canada data on the effective borrowing rate on business loans, shown in the chart below. 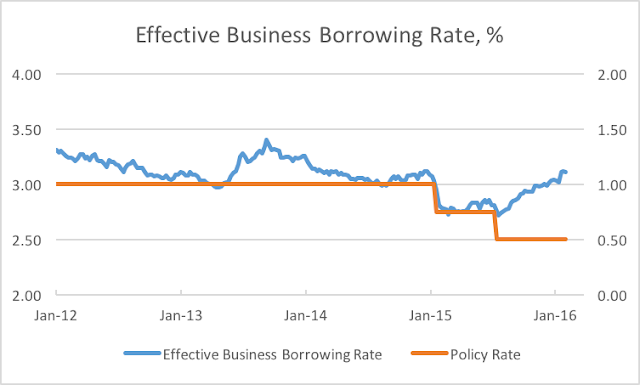 The interesting aspect of this chart is that, while the effective borrowing rate fell when the BoC cut the policy rate in January 2015, it actually rose after the second rate cut to 3.12% by early February, virtually unchanged from where it was before the BoC began cutting the policy rate. In summary, the bond market is telling quite a different story from the one used by the BoC to justify remaining on hold on January 20. The market, via the breakeven inflation rate, is saying that the risk to inflation expectations is that they may be becoming unanchored from the 2% target on the downside, not the upside, with market-based long term inflation expectations falling to just 1.3%. Through the yield curve, the bond market is saying that expected real GDP growth is falling, not rising, in spite of expected greater fiscal stimulus. Through the corporate credit spread, the market is saying that financial conditions are tightening, not easing, and have reached levels not seen outside the credit crisis of 2008-09. ... Is the Bank of Canada Listening? Since the BoC decided not to move on January 20, much has transpired. Crude oil prices, which opened the year at US$37 per barrel, have fallen below US$30/bbl, or by another 20%. Amidst financial market turmoil, other global central banks have eased policy further, either by moving to more deeply negative policy rates (ECB, BoJ, Sweden's Riksbank) or by tempering policy rate guidance (US Fed). The Canadian dollar has rallied as other central banks have eased their monetary policy stances, trading today about 5% higher than just before the Bank of Canada decided to leave the policy rate at 0.50%. The decision by the BoC to stand pat contributed to the appreciation of the Canadian dollar while the oil price and the terms of trade have weakened further, inflation expectations have taken another sharp step down, the yield curve has flattened indicating weaker expected real GDP growth, and the corporate spread has widened pointing to tighter financial conditions. To be fair, the BoC could not have been expected to anticipate these recent developments. But these developments point out the potential costs of waiting for the federal budget, which is unlikely to bring any major surprises for the markets. The BoC would likely have preferred not to have to deal with a further drop in oil prices, financial market turmoil, and shifting foreign central bank policies. However, they are now a part of the macro environment that the BoC must take into account as it decides whether to stand pat again on March 9. ..to add to your comment on tighter financial conditions for business, funding costs for banks have gone up (albeit slightly) over the last two weeks across the yield curve from being flat to 12 basis points depending on the tenor.